The PTGL web server provides a database of protein secondary structure topologies. It is based on protein ligand graphs computed by the VPLG software. The PTGL uses a graph-based model to describe the structure of proteins on the super-secondary structure level. This web server allows you to search for protein motifs which can be detected in the graphs. 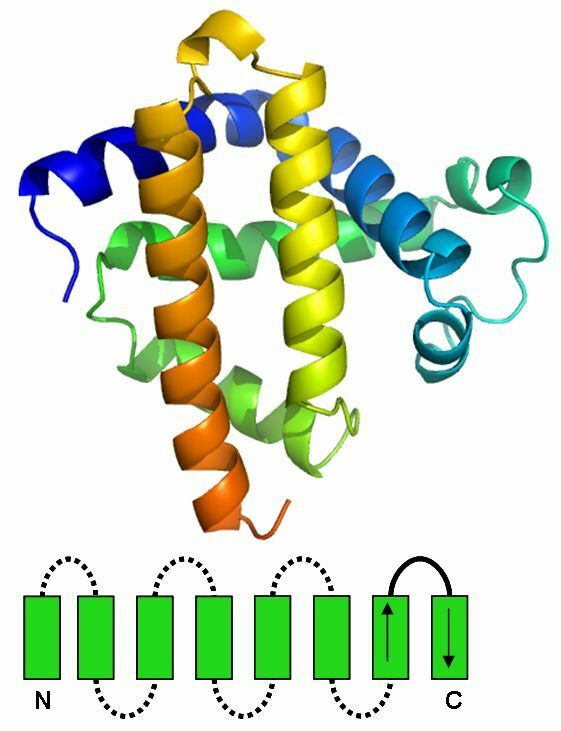 It also provides standardized 2D visualizations of protein graphs and folding graphs. In contrast to the manually curated CATH and SCOP databases, the method used by this server is fully automated. Similar servers, which also support substructure search, include ProSMoS and Pro-Origami. Use the standard search form above to search protein topologies by keyword. of interest and select the "Search" button. Enter a query PDB ID, e.g., '4a97' to display complex information for that PDB file. Select the graph type and notation, then enter a query linear notation string, e.g., '[e,10ae,-1ae,-7ae]'. Note that this searches the whole database and may take some minutes. 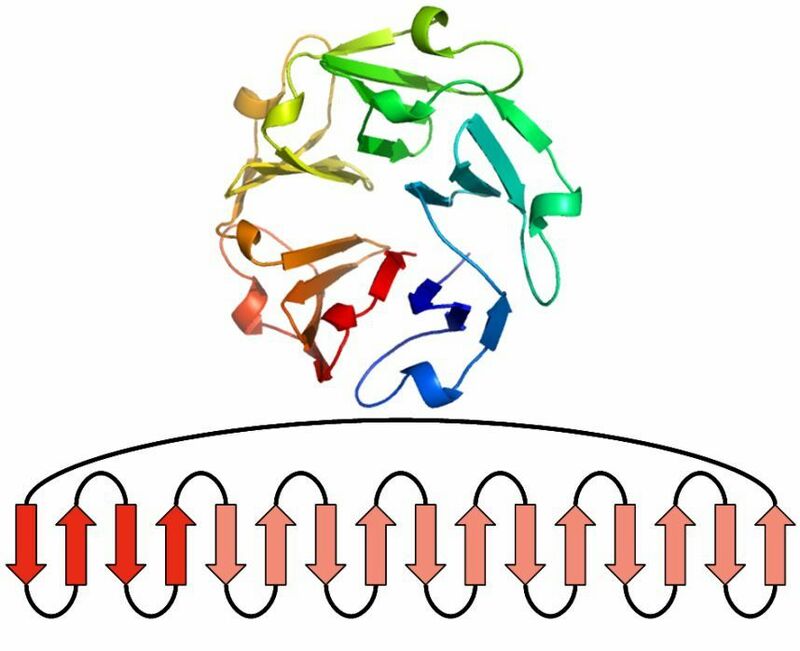 Selects a few random protein chains to explore. This user guide explains how to use the different search options. You can click the text boxes to get more detailed information. If you need want to learn about protein graphs, are interested in understanding how this web server works, or need help interpreting the results, see the About page. In order to search for proteins simply enter the protein name or the corresponding protein PDB-ID into the search field. You can also use the two checkboxes to either remove sequence homologs from results or if you only want results that exactly match the input query. PDB identifier The 4 character unique indentifier for the structure as defined by the PDB. Begins with a number 1-9 followed by 3 alphanumeric characters. Title The TITLE record contains a title for the experiment or analysis that is represented in the entry. It should identify an entry in the PDB in the same way that a title identifies a paper.The PDB records COMPND, SOURCE, EXPDTA, and REMARKs provide information that may also be found in TITLE. You may think of the title as describing the experiment, and the compound record as describing the molecule(s). Has ligand Choose whether the protein has a ligand or not. Ligand name Search for proteins which contain a special ligand. Use the 3-letter ligand codes from RCSB Ligand Expo, e.g., 'FAD'. You can also use parts of the ligands long name. Molecule Search the PDB MOLECULE record for chain names, e.g., 'MYOSINE'. Use this form to search protein topologies. Enter keywords known to relate to the biological macromolecules of interest and select the "Search" button. Use this form to search topological protein structure motifs. Select one of the protein structure classes, either Alpha Motifs, Beta Motifs or Alpha Beta Motifs. For further information, click on the question mark behind each motif. 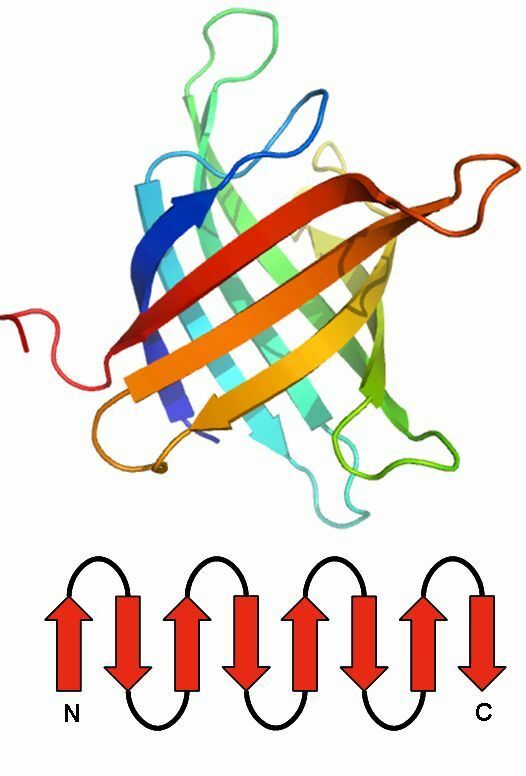 To submit a search request you have to select one of the following protein stucture classes, either Alpha Motifs, Beta Motifs or Alpha Beta Motifs. For each of these classes a subset of common folds is defined. Classification of Protein Structure Motifs is based on the possible composition of secondary structure elements in a protein domain. 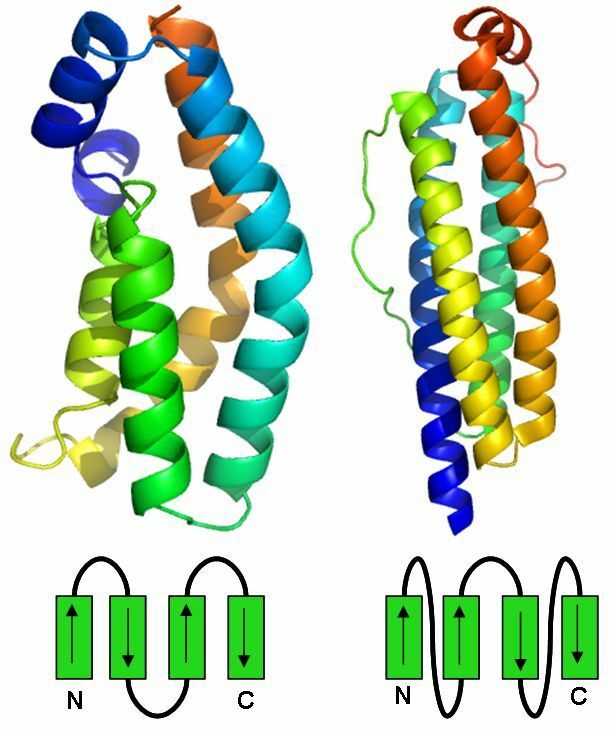 One differentiates between Alpha Motifs, which consist solely of alpha helices, Beta Motifs, which are composed of beta sheets and Alpha Beta Motifs, a combination of both, alpha helices and beta sheets. 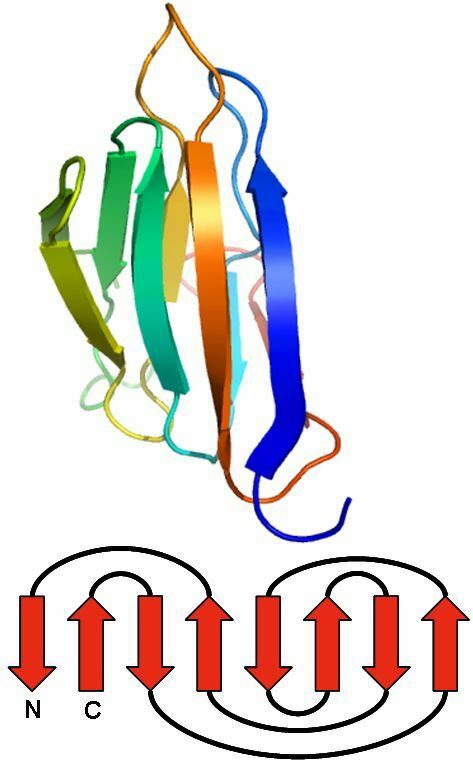 The Four Helix Bundle is a Protein Motif which consists of 4 alpha helices which arrange in a bundle. There are two types of the Four Helix Bundle which differ in the connections between the alpha helices. The first type of the Four Helix Bundle is all antiparallel and the second type has two pairs of parallel helices which have an antiparallel connection. 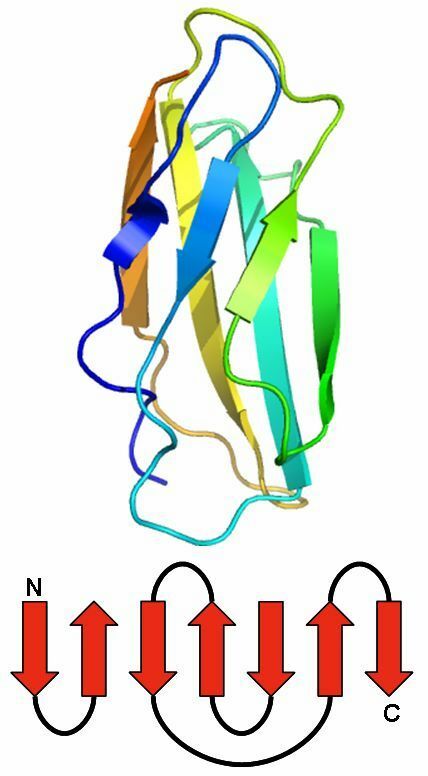 The Globin Fold is an alpha helix structure motif which is composed of a bundle consisting of eight alpha helices, which are connected over short loop regions. The helices have not a fixed arrangement but the last two helices in sequential order make up an antiparallel pair. The Up and Down Barrel is composed of a series of antiparallel beta strands which are connected over hydrogen bonds. There are two major families of the Up and Down Barrel, the ten-stranded and the eight-stranded version. The Immunoglobulin Fold is a two-layer sandwich. It consists of usually seven antiparallel beta-strands, which arrange in two beta sheets. The first is composed of four and the second of three strands. Both are connected over a disulfide bond to build the sandwich. This beta motif contains between four and eight beta sheets, which are arrange around the center of the protein. Four antiparallel beta strand form each sheet. One sheet makes up one of the propeller blades. To build a four-bladed propeller four of these sheets are grouped together. The Jelly Roll motif has a barrel structure, which seems like a jelly roll. The barrel includes eight beta strands, which build a two-layer sandwich, which each hold four strands. The Ubiquitin Roll motif contains alpha helices and beta strands. Two different types must be considerd. The first is composed of two beta-hairpin motifs and an enclosed alpha helix and the second an alpha helix which is surrounded by two beta sheets. This motif has four of five beta strand, which form an antiparallel beta sheet. In-between the sheet are two or more alpha helices. The Rossman Fold folds in an open twisted parallel beta sheet, in which the strands lie in-between alpha helices. The TIM Barrel includes eight beta strand and eight alpha helices. The eight parallel strands compose the inner part of the structure and the alpha helices lie around them to make up the outer part of the motif.